With effect from Febuary 2017 the German Aviation Authority (LBA) forbid non-employees to visit the maintenance area due to security concerns. Regularly (once or twice a year) I organise and lead and tour through the aircraft maintenance hangar at the Frankfurt airport. 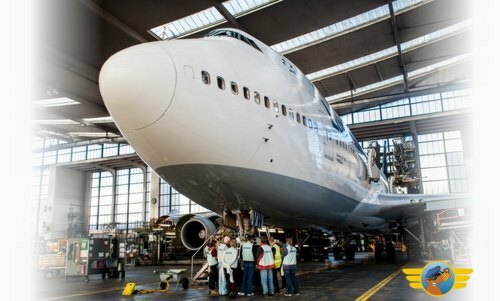 With a maximum of ten participants everyboby has the chance to "touch and feel" aircraft undergoing some maintenance action. Typically one long-range (B747-400, B474-8i, A330, A340) and one short-range aircraft type (B737, A320 family) will be available. In general, the tour will take about 1,5 to 2,5 hours and you can take as many photos as you like. Of course, I will be available for any questions during this time. You will be able to see and touch the wheels (and there are some pretty big ones around! ), learn about extension, retraction and braking. Flaps are important devices. But do you know what they are good for and how they work? You are going to know! The engines are vital parts of the plane. See them so close and even turn the fan blades! Learn about their function and depending components. Take a look into the huge cargo holds of a long range aircraft. I will tell you about some sepcific cabin items like the crew rest and the emergeny equipment we are carying on board of every aircraft. As we are now almost familiar with the technical stuff, you are going to learn more about piloting. We will start with some information about flight preparation, flight planning, aviation weather and airport charts. And finally (of course!) we are going to see what everyboy's waiting for: the cockpit. You will learn something about the general layout, specific panels and switches, differences between the aircraft types and some details about aircraft systems - or do you know how the autopilot knows where to go?